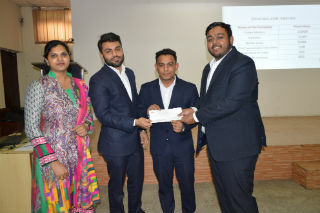 InvestoFin – The Finance Club of JIMS organised ‘Mock Stock Competition’ on 18th February, 2017 for the students of PGDM and PGDM (International Business). The activity aimed at showcasing the students’ general and financial awareness, critical thinking and analytical ability along with knowledge of portfolio management. 12 teams participated in the competition and each team consisted of 3 members. The teams were supposed to maximise their net worth by investing in the virtual stocks. There were three rounds in the activity. The teams were given an option to invest virtual money of Rs.10,00,000 in six stocks and the portfolio should have minimum two stocks. The national and international news and rumours were continuously flashed on the screen in all the rounds and stocks prices were fluctuating based on such news and rumours. 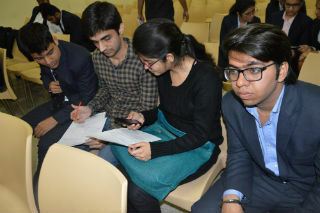 The teams were required to secretly identify the real news and the rumours based on their general and financial awareness and current updates. Teams were then buying and selling the stocks based on fluctuating stock prices and maximise their net worth. The activity was a big success as the students learned a lot in this activity along with enjoyment. The students had a fun time by answering various questions asked to them during the evaluation time which further enriched their general and financial knowledge. Key learnings: The activity gave students an exposure of spontaneous decision making, critical thinking and analytical ability using their general and financial awareness. 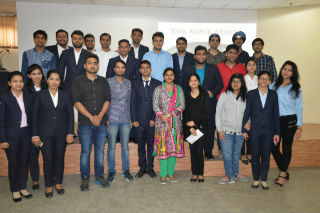 Various concepts of finance such as portfolio management, investment, maximization of wealth and net worth were also experienced by the students. Also, students got an exposure on how various events all around the world affect the decision making of the investors. 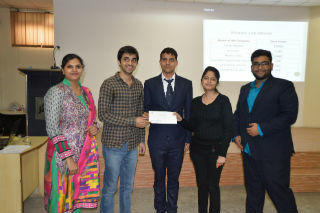 The evaluation was done using excel model after every round and after completion all the rounds the top three teams with three highest net worth were chosen as winners and runners up. The top three teams were awarded with Certificates and Cash Prizes.